For some of us being a Christian is harder than it should be. Discouraged, anxious, worn down, we wonder what happened to the power and the joy that Jesus promised. Jim Cymbala believes that many of us are missing something vital. 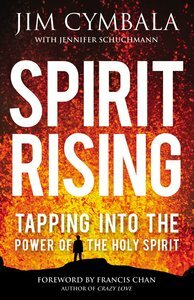 Christianity, he says, for even the best-intentioned person or church, is impossible without the Holy Spirit. You can have regular devotions, great preaching, a strong emphasis on the Bible, a great worship team, and a congregation that is trying, but if you aren't vitally in touch with God's Spirit, you are missing out on the life God has for you. The Holy Spirit, he points out, is God's agent on earth. Yet he is the least understood, least preached about, and least discussed member of the Trinity. That is sad, because without him, our spiritual lives will always become dry, mechanical, and a struggle. Too often, the body of Christ is divided into two sides. One side stresses the Word of God, separating itself from what it views as the emotional fanaticism often linked to those emphasizing the Holy Spirit. The other side is sometimes known for drifting into unbiblical manifestations and unorthodox teaching while attributing it all to the Spirit of God. But the Christianity we see in Scripture is both grounded in the Word and full of the Spirit. With stunning stories of how God is working in the lives of people and churches today and biblical teaching about the Holy Spirit, Jim Cymbala invites you to experience God in a fresh and vital way. Nothing else will change our prayer life, our study of God's word, and our worship more than opening our hearts to the Spirit. If we want power, confidence, joy, peace, and more love in our lives, then we need a better understanding of how and why the Spirit moves so we can join him there. Jim Cymbala has been the pastor of The Brooklyn Tabernacle for more than twenty-five years. He is also the author of the bestselling titles Fresh Wind, Fresh Fire; Fresh Faith; Fresh Power; Breakthrough Prayer; The Life God Blesses; The Church God Blesses; The Promise of God's Power and most recently When Gods Spirit Moves. He lives in New York City with his wife, Carol, who directs the Grammy Award-winning Brooklyn Tabernacle Choir. Jennifer Schuchmann is an accomplished writer, trainer, and speaker noted for creative and practical approaches to business and spiritual topics. The author of Your Unforgettable Life, Nine Ways God Always Speaks and Six Prayers God Always Answers.